For the past few weeks I have been dealing with some extremely debilitating anxiety and fear when it comes to working with Avalon. Aside from a few typical spooks, she has never proven that she is dangerous and unpredictable. Not once. She ties, will follow me anywhere, runs to the fence line when I get to the barn to say hello, enjoys the time I spend working with her, she picks up her feet, loves to be brushed, doesn't kick, pin her ears, doesn't take off, doesn't do anything that should make me not trust her. But, for the past few weeks I have been so nervous working with her that my palms get clammy, I get dizzy, feel like I'm going to throw up, and then won't do anything with her outside her paddock. I am not sure if the past two years with Finn has made me become this person or what...can a horse really screw me up this much? My entire car ride up to the barn I literally think about all the things that could happen and when I get there I choose to brush her in her paddock, play with her a bit, then leave. My confidence is just completely shot. On a positive note, I feel more of a bond with this little filly in a month, then I ever did with Finn in two years. But the fear and anxiety are completely debilitating. The other day me and hubby went up to the barn and after spending about twenty minutes in her paddock brushing her and playing with her he decided to stick the rope halter on her and take her for a walk. He walked her all over the property for about 40 minutes. At one point he had her in the blueberry patch a good distance from the barn, further than she's been, and he said "should I take her the long way, up the dirt road, and loop back around to the barn?" (WAY further than she's ever been). I said no, not a good idea. He did it anyway. Of course, she was an angel and didn't put a hoof out of place, or act like she was nervous. So what is it about me that I can't do this stuff? I honestly think I am past the help of a trainer and I need therapy. A sports therapist? A regular therapist? Who do I see? What do I do? I can't just get over it. I can't just think positive thoughts. It doesn't work. After hubby worked with baby for a while, and seeing that she was fine and wasn't going to do anything, I did walk her down the trail for the first time ever. She absolutely loved it, had her ears pricked the whole time, and had no issues walking away from the barn and the other horses. She's really an angel. I have no reason to feel the way I do. I'd love to get some suggestions from my fellow bloggers and readers!! She is way too cute. I am sorry to hear about the anxiety :/ I hope you find a way to work through it. Sorry I don't have any helpful thoughts. Hi Marissa, I'm new to your blog and have been playing catch-up; I'm still working on reading your story with Finn. He reminds me so much of a TB cross gelding I owned for about 7 months who completely destroyed my confidence as a rider. He didn't do any of the things Finn would do on the ground, but he did enough under saddle to make me feel completely inept as a rider...at the time I'd been riding for over 20 years and had trained horses with all sorts of issues, from all walks of life, especially OTTBs and TB crosses. I could not understand why nothing worked: I tried different varieties of natural horsemanship, trainers, jumping, dressage, trails, in a desperate search to find some common ground with him, something that he would enjoy that would also help him learn to trust me. Nothing worked. It didn't help that half the time he was lame or in pain somewhere in his body...every couple of weeks the vet was out to check him for one thing or another. And then one day he fell. While I was riding. And had a seizure. I was hurt seriously enough to put me out of commission for 2 months, both at work and riding. My vet diagnosed him with a neurological disease that we never did get worked up because I knew I'd never ride him again. I was too afraid: I finally understood why none of the training had worked. The problem was him, not me. And I couldn't spend one more dime on him, even if I'd wanted to. My vet helped me find him a home as a companion horse. Regardless, it shattered my confidence as a rider for a very long time. A VERY long time. It's taken me a good two years to get over all the damage he caused, and I only had him for 7 months. It affected my early relationship with my current mare as well, creating issues that may not have been so bad if I had been in a better place mentally and confidence-wise. I talked to other people that were afraid and I read a lot of blogs where people were going through issues so much worse than mine. Knowing that I was not alone helped a lot. I didn't really talk to anyone about it, but I wrote about every small breakthrough on my journey back to being the horsewoman I was before Rhythm. It's just taken time and patience. And also learning that Lily is NOT Rhythm. I think that was the hardest part and the part that took the longest. Since you were with Finn so much longer than I was with Rhythm, I'd think talking to a professional would help speed the healing process along. I would start by looking up psychologists with experience managing PTSD. What you have, and what I had, is a form of PTSD. I think this type of therapist would help you the most - you loved Finn but it was still a traumatic experience, plain and simple. All that fear and anxiety that you bottled up so you could handle him is what is coming out to the surface now. I'm sorry for the super long comment. I hope you too can find your way back to being the rider and horsewoman you were before Finn. I just wanted to let you know that you are not alone. Sometimes just knowing that can make a world of difference. Oh my gosh....your comment literally has me in tears. Thank you for sharing your story--I'm sorry about Rhythm. Your story with him sounds so similar to my experience with Finn. I am hoping that time and patience will help. I got Avalon less than a month after giving up Finn, and it wasn't enough time at all to get over the loss, but at the same time I wouldn't have it any other way. My biggest issue is the same-- learning Avalon is not Finn, and isn't going to have the same issues as he did. At one point I tried Finn in individual turnout and he was so stressed out he galloped around for 5 hours and tried to break the fence down. 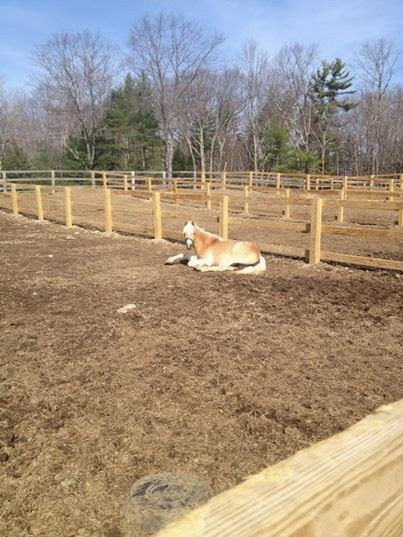 Avalon is also in individual turnout and sleeps, laying down, a lot. Every time I see her relaxing I think: that's weird, what's wrong with her?! I have to constantly remind myself that she is not him. If things don't improve and I don't start to feel better with time I am definitely going to look into finding someone to help. THANK YOU again!! Your comments really meant so much to me, and it definitely helps to know I am not alone. Are you at all familiar with Andrea Waldo? http://www.stresslessriding.com/ Really cool human being, skilled rider and instructor (so she “gets” the horse thing in a way that many therapists might not), and has a great (I think; individual mileage may vary and obviously fit is important!) approach: matter-of-fact and upbeat and non-judgmental. She’s Vermont-based, but also works over phone/Skype and does occasional clinics down in our general area. I was coming here to post this! Andrea is terrific. She's clinicing in New Hampshire in June: https://www.facebook.com/events/237924669730833/?ref=3&ref_newsfeed_story_type=regular. I'm so sorry you're dealing with this. I've had periods in my horse life where I've experienced extreme anxiety much like you are now. About ten years ago, I couldn't get on a horse without having a full-fledged panic attack first. It does get better, and seeking experienced help - whether from a trainer or a therapist - is an excellent idea. Thank you girls!! I have not heard of her, but checked out her website. I'm definitely going to get in touch with her. If you really feel like your anxiety is overwhelming then you need to see a professional. Maybe just for a little while.You don't want to have full fledged panic attack out with the new baby. Or you can do what i would do..pop a Xanax and take your horse for walk. 5 feet further every day and before you know it you will be traveling all over the place with her. My husband has beta blockers for public speaking. They help the body with the physical effect of nerves. Maybe it's something you could talk to a psychologist about? I totally understand the fear! I have that when I first start riding Shy. There is a 10 minute window where my fear is at it's worst, but after that, it goes away. This is each and every ride. I have friends who walk and talk me through it and I force myself up in the saddle because I know things will be fine and I can handle it. But that first 10 minutes is the worst. Each person has their own way of handling their fear. Have I mentioned that she is a gorgeous filly? I want to hug her so bad! Hi Marissa. I am new to your blog but not to the issue of anxiety. I suffered from it for most of my life. It was not related to horses but certainly to everything else. I was afraid (no, terrified) to let my children out of my sight, couldn't ride in an elevator, couldn't drive more than an hour from home, and on and on. I got counseling but found that the best results came from taking a low dose of an antidepressant. Perhaps that or another short-term medication would help you conquer enough of your fears to start slowly building a trusting relationship with your beautiful girl. I would also recommend a good therapist. Find one who is very proactive and will give you techniques, etc. to practice. I've been to several therapists who will listen to you, nod, and then ask, "how does that make you feel." Not particularly useful since I always knew how I felt--panicked!! I finally learned to ask the therapist directly about their style. I recently found one who is amazing. I used to say that going to see her was liking getting a shot of empowerment. Her approach was to listen, support me, and help me find solutions. And finally, I would say that you don't need to solve your problem immediately. Take some of the pressure off yourself by accepting that for a while, you will just enjoy grooming or walking your horse and forming a bond. The stronger the bond, the more you will begin to trust that she will love you and look after you. Then start with short rides, perhaps with your husband walking beside you. Give yourself the gift of time to heal from two years of a difficult situation. I hope this helps a little.